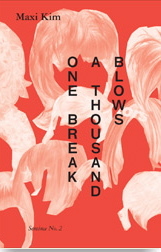 BETALEVEL » One Break, A Thousand Blows! One Break, A Thousand Blows! Book Release Party for Maxi Kim with performances by Christine Wertheim, Gina Clark, Daiana Feuer, and Gerard Olson. One Break, A Thousand Blows! is a novel about Japan. The protagonist is a metaphor, wanting to negate Japan, but not by writing a novel about Japan, but by writing falsely about it, using Japan as a screen for the author’s innermost hopes and desires. One Break, A Thousand Blows! aims to express the claim that there is no gap between sexuality and textuality; it aims to be anti-metaphorical, to escape the logic of modernism and postmodernism and express a pre-modernist, post-human morphogenetic aesthetics in all its wild sacred expressivity. Maxi Kim is the grandson of illiterate Korean peasant farmers. He is a recent graduate of CalArts MFA Writing Program, currently researching a Phd at the University of Greenwich. He has worked with performance artists Gina Clark & Janice Lee, editorially with Matias Viegener and Christine Wertheim, and organised events with Chris Kraus and Mark von Schlegell. This is his first novel.